The Steelers are licking their wounds after Sunday’s somewhat stunning loss in Baltimore. Not only were they beat up on the field, but it appears they suffered a rather big injury off it. Adam Caplan of The Sideline View is reporting that starting right tackle Willie Colon could be lost for a significant period of time with an arm injury. Caplan says it’s believed that the injury is in the triceps area. Colon was inked this past offseason to a big five year deal worth $29 million. If he’s lost for a long amount of time or even the season, the team could go out and bring back Flozell Adams, who was released and not brought back this offseason. Right now Chris Scott is listed as Colon’s backup. Caplan also pointed out a couple other tackles on the market – Ryan Harris (injured/back), Jon Stinchcomb, Nick Kaczur, Mario Henderson, (former Steeler) Max Starks and Adams. 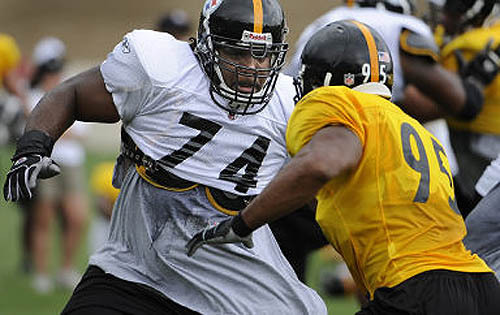 2 Comments on "Colon Could Be Lost For a Significant Amount of Time with Arm Injury"
Why did the Steelers get rid of Graig Urbak with the Buffalo Bills. He’s starting and will probably have a great career. Two things Pittsburgh knows nothing about defensive backs and offensive lineman. Other than Faneca who in the hell did they have that was a consistant blocker. Poor Ben will be out of football in four years or less because of the mauling he takes. It’s a miricle that he’s alive. I wince every week watching the beating he takes. Why don’t someone step up and be a man and block. Here we go again!! Early, significant injuries to the O line…the depth will be challenged right away it appears. Do they call Flozell or what about prying Alan Faneca out of retirement? He’s going to be on 93.7 the Fan around 9:30am being interviewed…I bet they ask him if he’s been contacted by any teams.